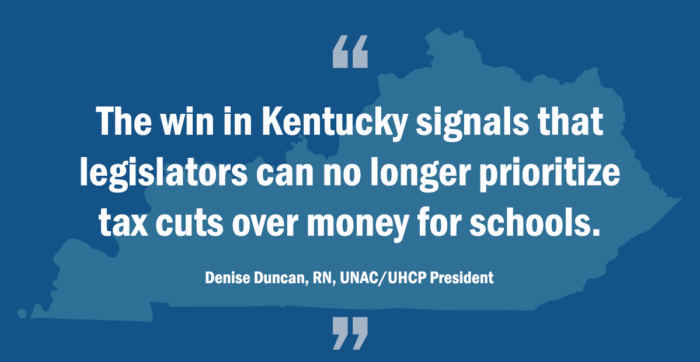 UNAC/UHCP President Denise Duncan, RN, released the following statement about the successful drive to increase public education funding in Kentucky. “In a major victory for Kentucky teachers, the state legislature voted today to override Governor Matt Bevin’s veto of a budget bill with nearly $487 million for schools and a tax bill to help finance the increased spending. “Elected officials and teachers had returned to the Kentucky state Capitol earlier today as the fight for public education funding continues. Educators and supporters rallying in Frankfort held signs with messages including, ‘We’ve had enough,’ ‘Do your job, fund our schools now,’ and ‘Something doesn’t add up’. Dozens of Kentucky’s 120 school districts were closed today due to the planned civic action. “After teachers in West Virginia and Oklahoma in recent weeks fought for increased funding to schools in their states, both legislators and teachers are coming to terms with a dramatically different political landscape. The win in Kentucky signals that legislators can no longer prioritize tax cuts over money for schools. United Nurses Associations of California/Union of Health Care Professionals (UNAC/UHCP) represents over 30,000 registered nurses and other health care professionals, including optometrists; pharmacists; physical, occupational and speech therapists; case managers; nurse midwives; social workers; clinical lab scientists; physician assistants and nurse practitioners. UNAC/UHCP is affiliated with the National Union of Hospital and Health Care Employees and the American Federation of State, County and Municipal Employees, AFL-CIO.